Most of the time, our biggest enemy is our own self. Our mind fills us with thoughts of doubt, fear, despair and discouragement. 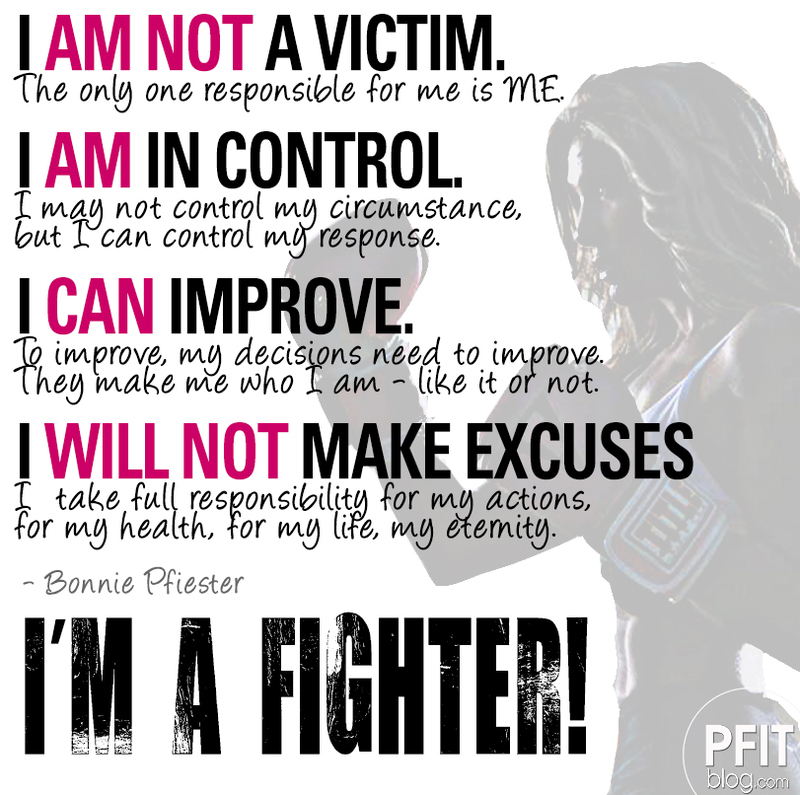 As Joyce Meyer loves to say, “you can’t be pitiful and powerful at the same time.” You simply can’t be a victim and a fighter. The only way you can power through this crazy life is you have to decide to let go of the pitiful excuses and thoughts. We can’t continue to just let life happen to us without taking responsibility for our own past mistakes and current actions. You Shape You. Not your past, not your friends, not your circumstance. How often do we play the victim? Whether we struggle with our weight or our finances, most of the time our circumstance is a result of our own poor decisions. We struggle with our weight because we lack discipline or were careless. We can make excuses until we’re blue in the face but, ultimately, no excuse is of any real value. Even if we didn’t mean to get where we are – we are here and we have a responsibility NOW to do something about it. We may be in debt to our eyeballs because we lived past our means. We struggle with relationships because we have been selfish and we treated people poorly – especially the ones we love most. Even the best of us, the good-hearted, mess up. Most of the time, we do get what we deserve to a certain extent. However, we have a choice to make a chance today, no matter what we did to mess up yesterday. You can go from victim to fighter with one single choice. Many of history’s “greats” had everything going against them. Sure, there are many things that happen to us that are not fair. Cancer is not fair. Losing a job may not be fair. Life often is unfair – BUT, that does not justify quitting or not trying. We fight. We grow. We improve. We learn. We inspire. We conquer. If you’ve been unhappy with your weight, your finances, your marriage, your life…Don’t fall for the “woe is me” downward spiral. Fight for what you want. Fight for what is right. Fight to become who God intended you to be. Don’t always do what’s easy. Do what is best. Don’t settle. Don’t make excuses. And never give up – because doing what is right will always be worth it. No regrets! Hell yeah, this is what I’m always saying. Even if things aren’t ideal, and I have some disadvantages, and the deck is stacked against me in some ways, that doesn’t mean I shouldn’t at least TRY. Unfortunately it seems a majority of people nowadays disagree with this mindset. I’m apparently “oppressed” and should just give up trying in every facet of life, according to them.